The right book at the right time. In a 24/7 entertainment-driven news cycle, it’s easy to forget what happened just two years ago. But Max Forte does not let us forget. He just completed the definitive work on the NATO bombing campaign and regime change operation in Libya, a campaign where the public was often told the inverse of the truth. In an era of “permanent war for permanent peace,” Forte’s revealing exposé highlights how rhetoric about “saving” lives abroad can lead to the opposite. 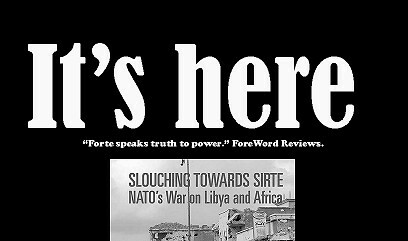 Now, in its first public launch in Hamilton, Slouching Towards Sirte can help prevent our minds from “slouching” during the next “humanitarian intervention” by the West in a sovereign country, perhaps Mali or Syria. Come join us for your chance to obtain a copy of this new Canadian book accompanied by Forte’s explanation of why preventing Canada’s participation in U.S. foreign wars is more important now than ever before. The two talks come at a time of growing calls to “do something” in conflicts all over the world. What if, as in Libya, NATO members and allies are already taking sides in civil wars and preparing the ground for intervention in other countries, such as Mali and Syria? Maximilian C. Forte gives us a look into these mechanisms in the ongoing disaster that is the “humanitarian intervention” in Libya. Across the Atlantic, for those of you in or near Dublin, Ireland, please consider joining our friends and comrades at the Dublin G8 Alternative Summit, with events starting on Monday, June 17, and continuing on Tuesday, June 18. Keep in touch with Facebook event page for the Dublin Alternative G8, and their Twitter feed. All three of these events, held in Canada and Ireland, have a common link: both will be focused on “the new scramble for Africa,” humanitarian imperialism, and to varying degrees the war in Syria. I sincerely regret that I could not participate in the Dublin event as the invited featured speaker, but there will be more collaboration in the future to be sure. Read this book with interest in Libya. There are many truths and good methodology of how to close read and see the meanings in various despatches and speeches-Obama’s attitude, despatches of USET, the links of corporates like Bechtel, the networks with Islamists. The links with what is currently happening in Libya and also Syria are felt on the ground. You have rightly said that you have not used on-the-ground ethnographic details or day to day life. I have witnessed the happenings on the ground, saw the two fights for Tripoli, February 2011 and August 2011, the differences and also how Libya shapes up- 2012-One year on, and 2013 two years on. As the common people see the lack of governance, the political isolation law (selectively applied), militias and insecurity, some questions are being asked. However, general situation is not conducive to having open debates on these issues. For those who are not visitors or in far off Universities, but staying on the ground, there has to be a level of self-censorship for existential reasons. Suffice it to say that your book is being read, discussed in Libya for its many interesting perspectives.